If you think that the stubble beard style looks better on you as compared to a clean shave style look, then this is the right guide for you where we will help you find the best beard trimmers for stubble look. What is a Stubble Beard Style Look? When you shave your facial hair and after a few days (3-4 days) you see the facial hair has grown up to 0.4-5mm is called the Stubble. This type of facial hair is grown in an uneven pattern and it looks a bit messy too since the stubble grows at different lengths. You might also have got some bald areas on your face where there are less or no facial hair at all. In order to have that cool stubble beard look, all the facial hair must be of the same length. Why Go For a Stubble Beard Style? The number one reason to go for a stubble beard style is the ease to take care of it every day. You can simply choose not to shave for days especially if you have sensitive skin and you’re prone to acne or any other skin condition that prevents you from shaving on daily basis. If you are bored with the same short stubble look, then you can try different beard stubble styles like medium and long stubble. You can also try different beard styles like a goatee or round beard. Can I use my hair clipper to trim my beard? The answer is maybe – You might find both hair clipper and beard trimmer functions in the same manner but they both are designed for different jobs. The blades in the beard trimmer are thinner as compared to that of the hair clipper. Because the beard trimmer is specifically designed to take care of the shorter hair and it’s best for detailing works that are perfect for the beard. The blades in the hair clipper are thicker that are able to easily trim thicker and longer hair. You will find comb attachments with both hair clippers and beard trimmers but the difference is that the comb attachment that you will get with a hair clipper is larger in size. Hair clippers are not able to do the detail trimming that is very important for trimming and styling the beard closely. Therefore, beard trimmer is the best tool for trimming your beard. Beard Trimmer Vs Stubble Trimmer – What’s The Difference? Before we start reviewing the best beard trimmers for stubble look let’s first clear the difference between stubble strimmer and beard trimmer. Majority of the beard trimmers that you see can give you a good stubble look, however, not all stubble trimmers are able to trim longer beard properly. Whereas, you will also find certain models that can do both the jobs properly by trimming longer beard and give you a great stubble look as well. It is best to identify your requirements and then decide whether you want to trim the longer beard or you want to have a trimmer that has both the options. The major difference between the stubble trimmer and a beard trimmer is the length settings. The stubble trimmer must be capable enough to trim your facial hair very short (0.3mm – 0.5mm or 1/64inch) for a nice stubble look. If you have a stubble that is 5 or 10 days old, you can simply adjust the setting for 5mm or 1/5inch that can easily trim and shape your stubble which is five to ten days old. If you want the trimmer to cut the facial hair extremely short, you can use the trimmer without the comb attachment. You also need to make sure that the trimmer is safe enough to be used without the guard. This way you can get really short stubble but it won’t be able to give you a close shave look that you can get with a razor or an electric shaver. Using the trimmer without the comb attachment is the best option for men with sensitive skin or if you have an acne problem and can’t use a razor. If you want to have a short stubble look, the beard trimmer must be able to adjust from 2-5mm. For a medium stubble beard style the trimmer must be able to adjust at 10mm and for the lumberjack beard, you need a beard trimmer that can be adjusted at 20mm or higher. This Wahl Beard Trimmer 9818 is the on the top of our list for best beard trimmers. It’s a cordless trimmer that comes with the best quality self-sharpening blades. The look of this trimmer is really elegant and it also feels really good to hold it in your hand because of its stainless steel body. After one hour of charge, Wahl 9818 gives you a runtime of 4 hours and no other brand of beard trimmers last this long, thanks to its Lithium-ion system. It also has a quick charge system that allows you to charge the trimmer in just one minute that allows you to use it for 3 minutes. This trimmer does its job smoothly without pulling any hair whether you want to trim tough facial hair or you need it for minor detailing, it is the best tool for your beard. 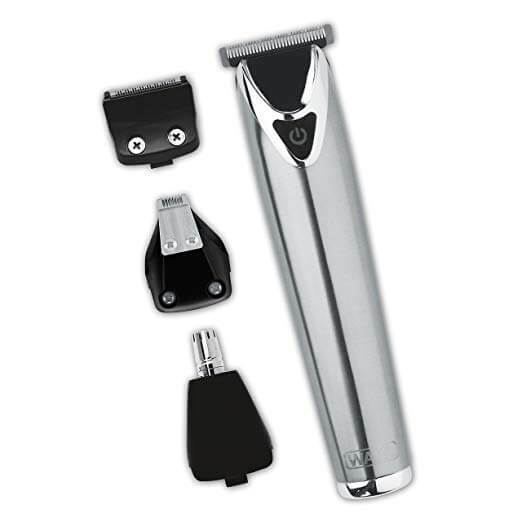 There are altogether 4 attachment heads that you will get with this trimmer. The best tool that I like in this Wahl Trimmer 9818 is the detail trimmer attachment that is very helpful for detailing works like shaping up different beard styles like goatees. The other 3 attachment heads that come with this trimmer are T-blade, detail shaver and nose, and ear trimmer. The T-blade does most of the job and helps to trim beard and mustaches. The detail shaver gives you a closer shave and the nose and ear trimmer help to trim nose and ear hair. 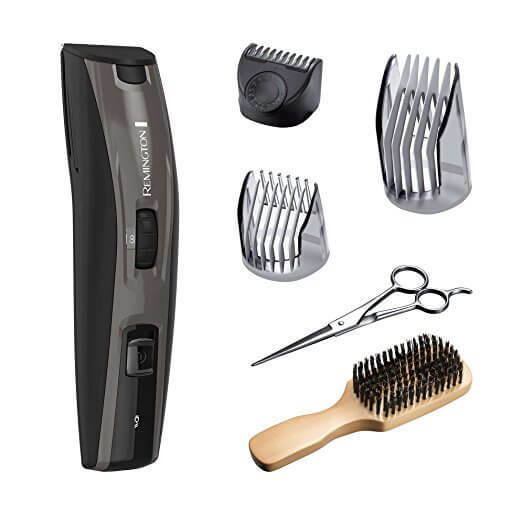 You will also get 12 comb attachments with Wahl 9818 Lithium-ion plus beard trimmer from 1/16 inch to 1 inch for trimming different lengths of hair. This trimmer comes with a five years warranty. 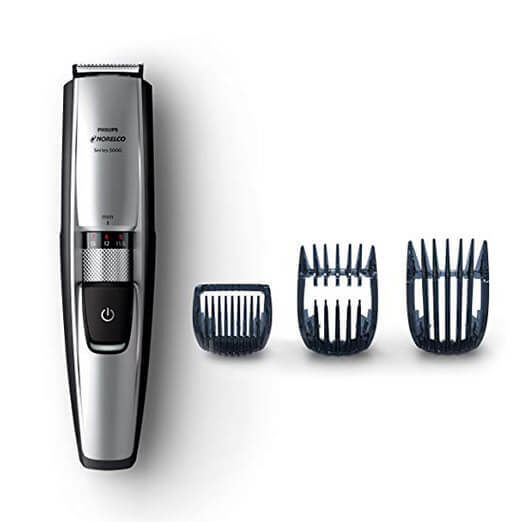 The Philips Norelco 5100 is another best beard trimmer for those who don’t want too many hair comb attachments and still want a trimmer that provides various length options. This cordless Beard trimmer comes with self-sharpening stainless steel blades that are capable of trimming twice as much hair in just a single pass while preventing you from irritation. One of the main reasons why we have selected Philips Norelco 5100 beard trimmer to be on the 2nd spot in our top list is that it has 17 length variations to select. It can also trim shorter hair (1/64 -1/2 inch) as compared to the Wahl 9818 model. You can easily adjust the length settings with the help of a zoom wheel on the trimmer rather than switching different comb attachments back and forth. This trimmer has a beard guide technology that lifts the hair and cuts it more efficiently. You can also use the extra 2 short and long hair comb attachments as a hair clipper. The short comb can be used for a length from 0.4-7mm and the longer attachment can be used for long hair length from 7-13mm. You can also trim your beard without using any comb attachments without tugging and pulling the hair. The Philips Norelco Beard Trimmer 5100 is fully waterproof that makes it very easy to clean, however, you need to keep in mind that although this beard trimmer is waterproof, it is not designed to be used while taking shower. The waterproof feature is to make the cleaning process simple and easy. The runtime of this beard trimmer is 70 minutes and takes about one hour to fully charge the trimmer. You can also use this trimmer while it’s plugged in, unlike Wahl beard trimmer. This is another Philips Beard Trimmer Series 7200 that we have added to our list and it’s very much similar to series 5100. It has a zoom wheel that allows you to adjust 20 built-in lengths from 0.5-10mm. 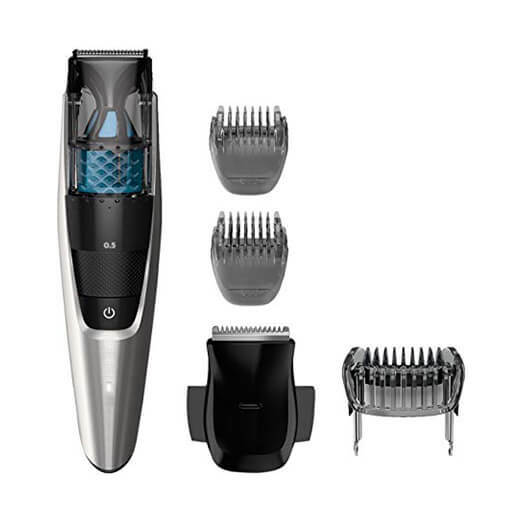 The most unique feature that you will get in this Philips beard trimmer 7200 is the vacuum system which is quite a nice feature if you hate to clean the mess after trimmer your beard. This vacuum technology is quite useful, 90% of the hair that you cut is caught up in the trimmer’s chamber with the help of the vacuum system. Once the chamber is full you can trash out the hair away. This is the only bread trimmer that has this vacuum technology. Although this Philips Norelco Beard Trimmer BT7215/49 is not waterproof, you can remove the cutting blade attachment that is made up of stainless steel and rinse it under the tap water to clean. Just like Philips Series 5100 trimmer you can also use Philips Series 7200 both corded and cordless. It takes about 1 hour to charge this beard trimmer that allows you a runtime of 80 minutes. We have listed Conair Man Stubble Trimmer on the 4th position. The blades are specially designed using electro-chemical technology making them sharp and long lasting, It’s best for precision and accuracy. You can safely use this trimmer if you have sensitive skin. You can adjust 24 length settings with this trimmer from 0.4-5mm. It has a nice LCD display which shows the selected length and it is also smart enough to remember the last length setting that you have used. 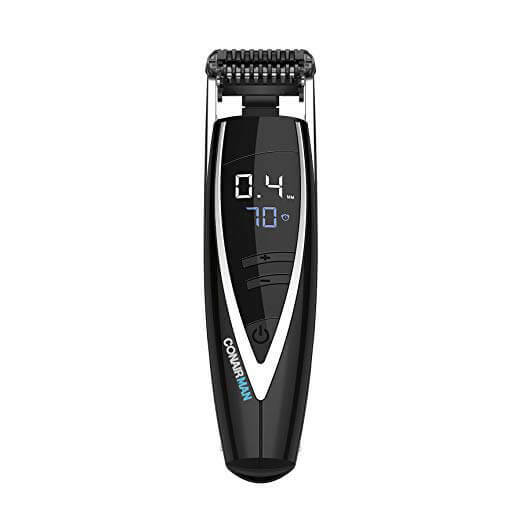 The Conair Man Super Stubble Beard Trimmer has a flexible head that easily adjusts with the shape of your face and gives you better control and trimming experience. This trimmer comes with a guide comb and it trims quite well with it, you can simply remove the comb for detailing work such as area under the nose. The Ergonomic design of this trimmer allows a better grip with a nice long body. The trimmer is waterproof that makes the cleaning quite easy and you can just simply wash it under the running faucet. You can also use this trimmer while taking shower and can add some soap or shaving gel if you like. It has a lithium-ion battery and once it is fully charged you can use it for 70 minutes and it takes about 80 minutes to fully charge the trimmer. The performance of this trimmer won’t go down even when the battery charge is quite low. If you want a beard trimmer that takes care of both the short and the long rugged beard, then the Remington MB4045B Beardsman is the right choice for you. It has self-sharpening blades that are made out of titanium. You are able to adjust 18 lengths from 1.5 to 35mm with this beard trimmer. You will get 3 additional comb attachments with this Remington beard trimmer MB4045B. It has a zoom wheel feature to set the length of the trimming combs in the right position. The XL comb will take care of the long beard and allows you to trim from 20-35mm. and the other two comb attachments take care of the short beard. The stubble comb attachment takes care of the short hair from 1-5mm, the medium comb attachment will take care of hair lengths from 20-35mm. It also has the detail trimmer that allows you to reach those difficult areas on your face and helps to detail your sideburns. The Remington beard trimmer MB4045B allows a runtime of 2 hours on 4 hours of charging. You just need to unclip the blade of the trimmer to clean which makes the maintenance of this trimmer quite simple and easy. How To Choose The Best Beard Trimmer For Stubble? 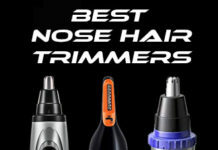 There are different types of trimmers available having various different features, therefore, finding the right beards trimmer for stubble look is a bit difficult. Here we have listed some factors that are important to know before buying a stubble beard trimmer. It is always best to select a beard trimmer that has several different length settings to choose from. This will allow you to adjust different hair lengths. If you want that 5 o’clock shadow stubble look, then your beard trimmer must have a length setting that is as low as 0.5 to 5mm. You are definitely going to hate it if you have to make many multiple passes in order to trim your beard. Therefore, you need to choose a beard trimmer that has a powerful motor that can trim your beard easily without wasting your time. The major benefit of a cordless beard trimmer is that it is portable and it allows you to carry it with you anywhere. The cordless feature is best for those who travel a lot. If you prefer a cordless beard trimmer, then It is important to check how much time it takes to charge the trimmer and how long is the runtime. If you’re a guy who prefers to trim the bread at home, then it is better to choose a corded beard trimmer because the corded trimmer has more power as compared to the cordless trimmer. You will also find beard trimmers having both corded and cordless features. The ergonomic design plays a vital role while selecting the best beard trimmer. The smaller sized trimmer is easy to hold and gives you a better grip while you’re trimming your beard as compared to larger sized trimmers. It is also easy to carry a small beard trimmer while traveling. There are certain beard trimmers that are waterproof and can be used to trim beard in the shower. If you prefer to trim your beard in the shower, then you must choose a beard trimmer that has a wet and dry feature. You will find some beard trimmer models that come with different trimming accessories like detail trimmer attachment, nose, and ear attachment. These extra tools are great to have since they give you more grooming options. These extra attachments are good and helpful but not necessary. Therefore, before selecting the best stubble beard trimmer you need to first focus on the most important factors such as length settings, the power of the motor, cordless feature, battery run time. If all these features are good to go, then you may check out the extra accesories that are available with the trimmer. Can you add advantages and disadvantages of these electronic shavers please? Hello, I’ve just added the Pros and Cons for the listed beard trimmers upon your request. Good post! Here is my problem with beard trimmers: I have very sensitive skin, prone to redness and rash. That is why I gave up on razors years ago. But even with decent beard trimmers, I get red, painful spots that last a day. Which trimmer do you recommend for sensitive skin with dermatitis? As per the details that you’ve provided, you seem to have sensitive skin and it is good that you avoid using a manual razor. 1. If you are using a beard trimmer you must always use it with a guard comb which will prevent any tugging and pulling that may cause irritation or rashes. 2. You may also go for a foil shaver since it is the best for sensitive skin and must avoid using rotary shaver since it’s specifically designed for heavy beard and thick facial hair. 3. Braun Series 7-790cc is the best foil shaver for sensitive skin but it does not have a wet shave feature, Braun series 9 comes with both wet & dry features that will allow you to have a wet shave using shaving foam or gel. 4. 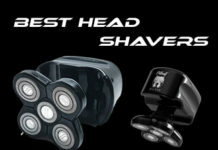 You may also check out the top electric shavers list here. 5. You may also check out this article on how to shave with an electric shaver without irritation here. Thank you. I read the post on how to shave for sensitive irritable skin. It seems there was a whole science I did not know about. Probably gonna need a new shavers as well. Is the Braun your personal favorite? Yes, I personally prefer Braun shavers since Braun makes one of the best foil shavers and you must go for the one that comes with both wet and dry features so that you may easily use it with shaving gel or shaving cream.